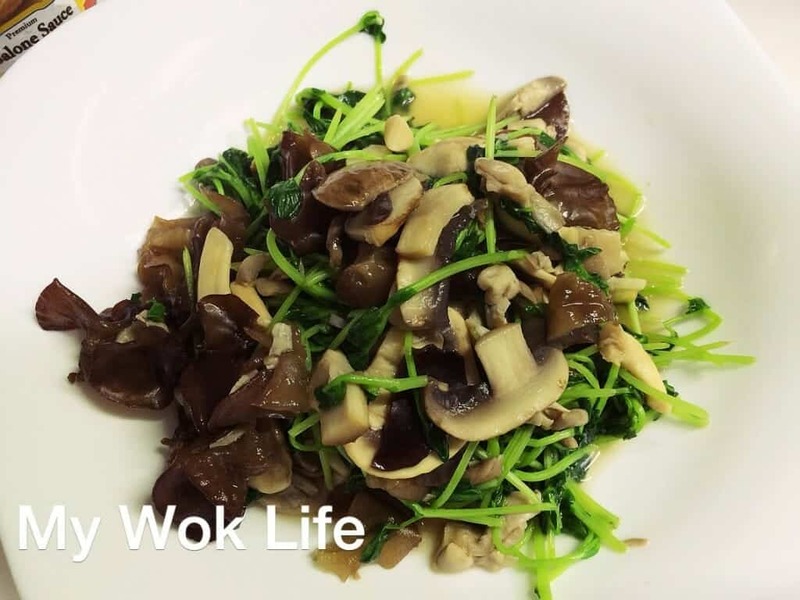 In order to fully appreciate the freshest taste and natural sweetness Of the fresh pea sprouts as well as the highly nutritious mushrooms, minimal use of condiment to taste is more than just required. I needed only the abalone sauce in my recipe. If you are a vegetarian, use the mushroom sauce. 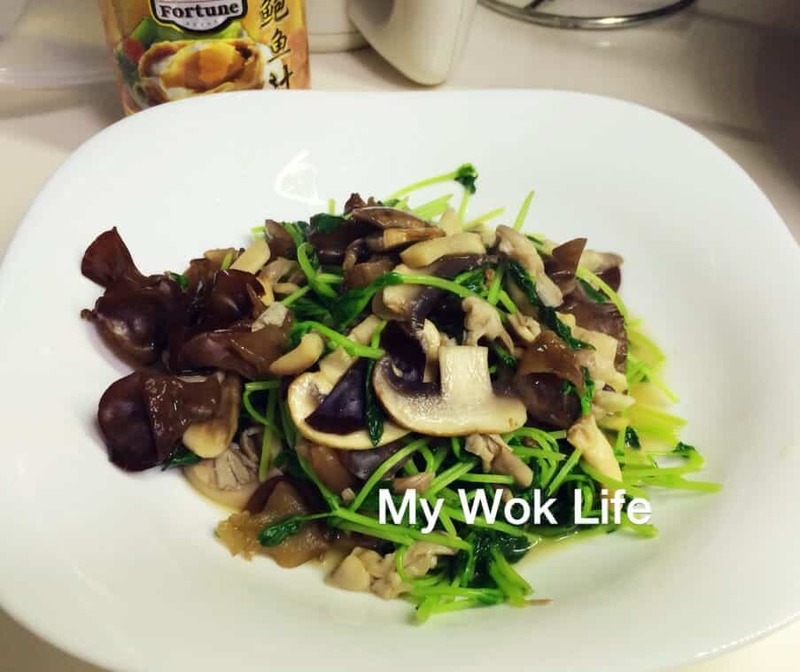 Otherwise, the Abalone sauce is the best to go with this stir fry! 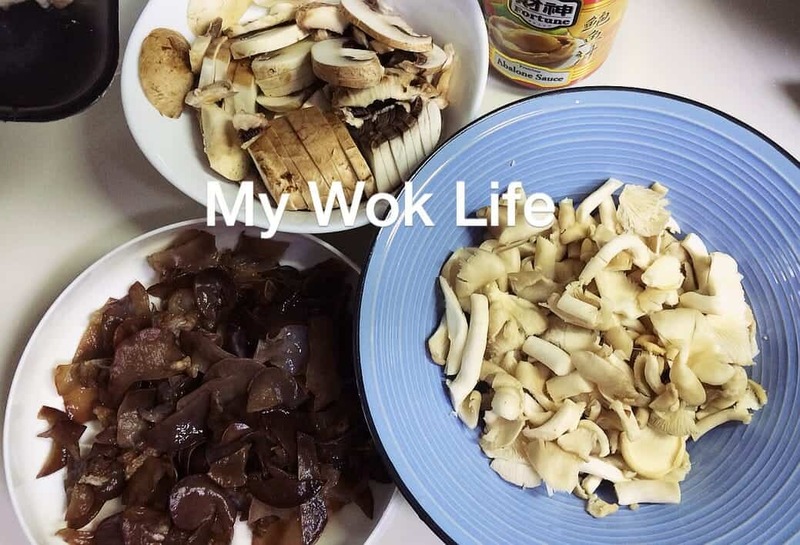 That’s because the golden spring mushroom (金源菇) used in this recipe yields a tinge of ‘seafood’ taste after cooked. Hence, adding abalone sauce was sure to good in enhancing the flavor of this seafood-tasted mushroom in the dish. (1) Heat wok with oil over medium-low fire. Stir fry garlic and ginger shreds till aroma releases, but need not to brown them. (2) Add assorted mushrooms and stir fry till soft. Drizzle abalone sauce and stir to combine. (3) 1-2 minutes before hear off, add pea sprouts and stir fry till turn just soft, with fresh greenish appearance. Heat off and dish up. Serve immediately with steamy hot rice. Edible mushrooms/ fungi are highly nutritious. The health benefits provided by the mushrooms are simply too many to be mentioned. Some of the highlights to me are helping to cleanse blood, remove toxin in the body and provide not only the basic nutrients, but they are rich in iron, B Vitamins and antioxidants. A portion of this low fat stir fry counts less than 100kcal. Tips: Fortune brand premium Abalone sauce used in my recipe. I liked its mild natural flavor. It is available in major supermarkets. * Golden spring mushroom resembles oyster mushroom, but they’re not the same. Golden spring mushroom has smaller petals and yellowish/ brownish in color. It yields a hint of seafood flavour which gives vegetarian/ vegan a different and more interesting choice of taste. ← A ‘Love it or Hate it’ Cake. Durian Cream Cake.